The Republic of Korea will return next month with a new tender for implementing an eLoran system, driven by North Korean jamming of GPS in the region. Initial plans to establish an eLoran-based back up faltered due to technical and requirements challenges that held prospective vendors back from bidding on the contracts. Details of the new plan were revealed in a presentation today (April 14, 2014) at a Resilient PNT Forum held in Rotterdam, The Netherlands, in advance of the European Navigation Conference (ENC 2014). The original plan, announced in April 2013, called for conversion of two Loran-C stations and the addition of three more eLoran transmitters to create an initial operational capability (IOC) by 2016. Deployment of 43 differential eLoran stations sought to provide a full operational capability (FOC) of 20-meter real-time positioning accuracy nationwide by 2018. An eLoran Advisory Committee of the Ministry of Oceans and Fisheries (MOF), Korea, was organized in June 2013 that included 15 committee members from universities and research institutes in Korea to support this program. However, three rounds of competitive bidding (in November 2013 and January 2014) for the proposed procurement drew only one proposal, which was ultimately not accepted by the Korean government, according to the authors of the PNT forum presentation, Jiwon Seo, assistant professor, School of Integrated Technology, Yonsei University, who is a member of the MOF eLoran Advisory Committee, and Je-Bong Oh, deputy director of the MOF’s Maritime Safety Facilities Division, who is currently in charge of the Korean eLoran program. • the 20-meter accuracy requirement for maritime operations covering the nation’s exclusive economic zone (EEZ). The new direction for the program calls for a two-phase approach. 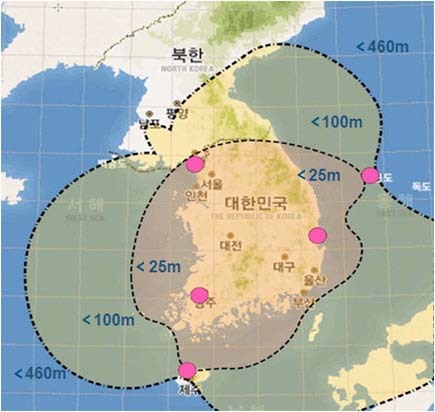 The first phase would implement maritime eLoran for the West Sea of Korea comprising three transmitters and two differential stations by the end of 2015. If demonstrated performance is satisfactory, a second phase would deploy more transmitters and differential stations to cover other areas. Efforts to cover inland areas would not move ahead unless a 20-meter accuracy on land is demonstrated by further R&D. • Two Loran-C transmitters in Pohang (150 kilowatts) and Kwangju (50 kilowatts) will be upgraded to eLoran transmitters. • An eLoran transmitter with 250 kilowatt ERP will be deployed in Ganghwa. • Two differential eLoran stations will be deployed, with bidders proposing the best locations for the differential stations. • The 20-meter maritime accuracy must be achieved within a 30-kilometer range from the differential stations. Multiple bidders are expected for this new round of bidding. In December, the MOF and the United Kingdom Department for Transport signed a memorandum of understanding (MoU) on Technical Cooperation in the Field of eLoran. Under the MoU, the General Lighthouse Authorities of the UK and Ireland (GLA) are providing technical advice to MOF. The MoU reflects fundamental concerns about GNSS vulnerabilities to intentional and unintentional interference and the need for a complementary system to provide resiliency. 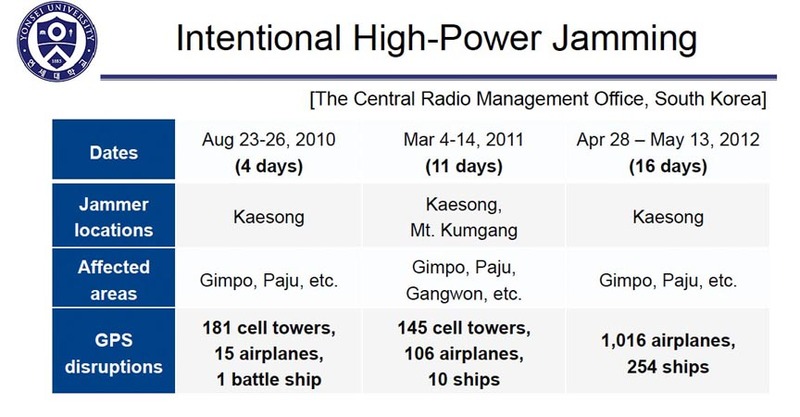 Korea moved to create the GNSS backup following jamming of GPS during three periods of increasing length between 2010 and 2012. The jamming generated numerous reports of navigation and timing problems in areas near the border with North Korea, reflected in the accompanying figure. Seo cited a report by the Chosun Ilbo newspaper describing an emergency landing of a U.S. military reconnaissance aircraft during annual South Korea-U.S. military exercises in March 2011 caused by North Korean jamming.